Jan Lungren is one of the rare Swedish jazz musicians with Nils Landgren and Ulf Wakenius whose notoriety extends beyond the Nordic countries. He was born on March 22, 1966 in Kristianstad, in the south of Sweden, and grew up in Ronneby. He learned to play the piano at 5 and later studied at the Royal College of Music in Malmö. Early on, he became familiar with the jazz scene and befriended veterans such as Arne Domnérus (ts), Putte Wickman (cl) and Bernt Rosengren (ts). Since then, he has developed a career as a leader emphasizing the trio format. His first album Conclusion dates back to 1994. If Mattias Svensson has remained his bass player over the years, his current drummer is Zoltan Csörsz, who took over from Morten Lund and Rasmus Kihlberg before that. For his latest album Man in the Fog, released by Bee Jazz last February, Lungren chose the solo form and deepened his research that blends jazz, classical music and Nordic folk music. Since 2010, Jan Lundgren –who as a younger man almost became a professional tennis player but finally followed the same path as Bobo Stenson rather than Björn Borg’s– has been leading the festival he founded in Ystad where he lives. During which, he performs and reveals the breadth of his possibilities, from European free improvisation to the tradition of swing music, with a real talent of artistic director, festival presenter and organizer. Jazz Hot: You first studied classical music. When did you discover jazz? Jan Lundgren: I was 14 or 15. I had a classical music teacher but she was replaced by an old German when she got pregnant. He was about to retire. After hearing me play a few pieces, he told me that he couldn’t teach me anything in classical music but he could introduce me to jazz music and improvisation. I had no idea what that was. For my first lesson, he asked me to buy a record by Oscar Peterson at the record store. It was a very strange lesson. There was only one record store in Ronneby. It’s a small town. The owner was a former musician and he knew exactly what recording I should have. It was Night Train. I was mesmerized when I heard it. I couldn't understand the music but I fell in love with it. It’s just like not understanding a language but understanding its vibrations. After that, I went back to the store and bought other jazz records. I continued to play classical music while learning jazz at the same time. How did you start playing jazz? I studied only one year with the German teacher. He really was't very good (laughs)! But he inspired me and he suggested that I play with a group, that I couldn't play jazz by myself. But I didn't know anyone until a youth big band called me to join them. I found guys to play with in a sextet named Saint Thomas Band. It was my first group. We played standards for birthday celebrations, weddings... We took every gig we could get! There was no real jazz scene in Ronneby. I had to find jazz musicians from nearby towns and cities. A year later, I met the great Swedish saxophonist Arne Domnérus, who became my mentor. At that time, I had been studying at the Royal College of Music in Malmö since I was 20 and had formed my first trio. Who were your first influences in jazz piano? Oscar Peterson, Bud Powell, McCoy Tyner, Bill Evans, Erroll Garner, Herbie Hancock, Red Garland and many others. It was a time when I wanted to hear everything: Cecil Taylor, Earl Hines, Swedish pianists like Jan Johansson, Bengt Hallberg, Bobo Stenson, everything from swing and bebop to fusion. Since recordings like Swedish Standards, released in 1997, you’ve been working on blending between jazz with popular Swedish music... Have you always been interested in this mixtures of genres? When you are very young, sometimes you don't appreciate your roots. I didn’t. I loved American jazz and wasn’t interested in Swedish music. When I got a little older, around 26-27, I started to get in touch with producers in Los Angeles and New York. I went to the USA a couple of times to record and play. When I was there, I felt very Swedish (laughs)! And I started to wonder about how to develop my own style. So I began to look into my roots. Slowly as I got to know Swedish folk music better I tried to see how I could reinterpret it. Swedish Standards was a breakthrough album for me in many ways. Immediately it gave me a bigger audience in Sweden. It was on the pop charts and aired a lot on the radio. It also gave me the occasion to make television appearances. All of that made it easier for me to survive as a jazz musician. You also played with Johnny Griffin, Benny Golson, Herb Geller and James Moody. What have you kept from these experiences? It was unbelievable to have the chance to play with them. The music has to pass through the generations. And they transmitted that tradition to me. I recorded with Johnny Griffin. He was a guest on my album Plays the Music of Victor Young. I recorded with Herb Geller in Los Angeles and I toured with Benny Golson and James Moody in Scandinavia. Great Swedish musicians like Arne Domnérus and Putte Wickman (cl) –who discovered me–, were also important for me. Jazz is a language you can only learn by playing with people like that. Is jazz music more a question of transmission than school training? I teach a little at a music college. Today unfortunately schools are the only chance for young musicians to improve. For me, jazz is not about studying but playing and learning from others. Is playing with Swedish and American musicians the same? There are many similarities. A great musician is a great musician. And what I love the most is to listen and play with great musicians. But you know, there are differences between the musicians in Sweden. Everyone tries to find his own sound and so naturally everyone is different. But, of course, the background is not the same in New York as in Ystad. However it is possible to adopt another culture if you love it. So the difference is the cultural background? For American musicians, jazz is a native language whereas European musicians have to assimilate this language? No. I think that in this case, the name of jazz can be a burden sometimes. Jazz is freedom. The freedom that allows you to find you own voice and develop you own jazz. Jazz has a history but has to continue to develop. In 2007, you released Mare Nostrum with Richard Galliano and Paolo Fresu. It was great meeting between three different personalities from different European traditions. And it worked very well: a combination of instruments and similar musical values based on improvisation and melody. It was a very melodic project. Each one brought his own compositions and songs from his own country. Mare Nostrum is the name that the Romans gave to the Mediterranean Sea. It meant "our sea”. Finally, the sea is like the music. When you flow with it, it gives you the possibility to connect with the world. It’s a beautiful way to understand what jazz is. 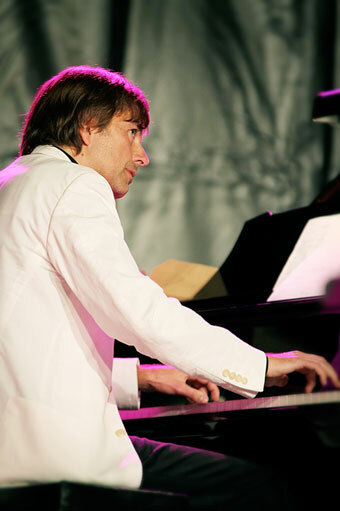 Since 2010, you are the artistic director of the Ystad Jazz Festival. Why did you decide to become a music programmer? 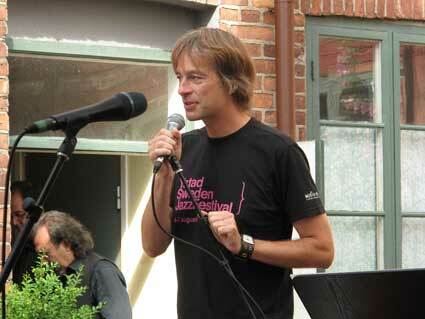 When I was young, there was a jazz festival in Ronneby and I had the chance to play there every year. In the last ten years, jazz festivals have disappeared from Sweden. So I thought that it was time to start a new festival and give people the opportunity to hear good jazz. That’s why I founded the festival of Ystad –where I live– with Thomas Lantz, its president. The festival was ingrained quickly since its first edition. I also wanted to prove that it’s possible to do a jazz festival and survive economically without programming any pop music. It’s all about a jazz audience and jazz musicians. We have to be proud to be jazzmen. Tomorrow, you are giving a tribute to Stan Getz and the Swedish pianist Jan Johansson with Harry Allen. How did this project come about? Jan Johansson is one of my first influences. I have paid tribute to him a several times. He is a very important musician in Sweden because he was the first one who blended jazz with popular music. His relationship with Stan Getz was also very strong. They played together many times and recorded together. I met Harry Allen a couple of times. We toured in Scandinavia last year and I thought it would nice to do this project with him. There are a lot of young and talented jazz musicians in Sweden. The quality of this scene is excellent and represents every jazz style. But the problem is how to survive... It was easier ten or twelve years ago. There were more opportunities, even in a small country. Today, as the audience is getting older it is more difficult. My task as the Ystad Jazz Festival artistic director is to showcase a large spectrum of jazz. It's a balance between different countries, different styles and male and female artists since jazz is often dominated by men. Each year, the festival also features Swedish jazz veterans like Hacke Björksten (ts) this year. How do you explain the strong jazz tradition in Sweden? Sweden was not involved in the Second World War. So jazz fans could get records from the USA for cheap prices and the entertainment scene stayed pretty much intact. Swedish jazz musicians were free to listen to modern jazz. From the late 1940s to the early 1950s, Swedish jazz musicians were very advanced. There were a lot of players who were inspired by bebop, like Lars Gullin (bs), Bengt Hallberg (p), Arne Domnérus (as, cl), Börje Fredriksson (ts) and many others. They played with American musicians, in Paris for instance. Jazz was very popular in the 1950s, especially in the big cities. It was the common man's music for that whole generation. The foundations of jazz in Sweden were built at that time, and very strongly. But jazz music lost its interest with the following generations. So my mission in Ystad is to use jazz to bridge generations and to gather musicians of all ages on stage for the audience to enjoy. It’s a necessity for the world's future to build bridges between cultures and generations. Young people can learn from older people and older people can be inspired by the young.